It may be winter but how about a walk on the beach? 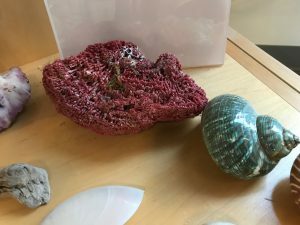 We have a collection of sea shells and corals on exhibit at the Southampton Library to help you think of those hot summer days. 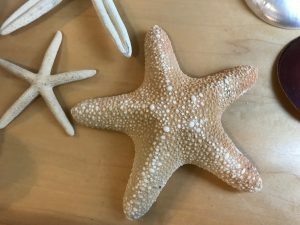 The display includes clams, conch, sea star, sea urchins and sand dollars – just a few of the approximately 50,000 – 200,000 varieties of seashells (marine mollusks) in the world. Also featured are spiny corals or hard corals. Clams, conch and snails (marine and land), sea stars, urchins and sand stars are all related. Conch spiral outward and their age can be determined by the growth of its shell similar to the rings of a tree. 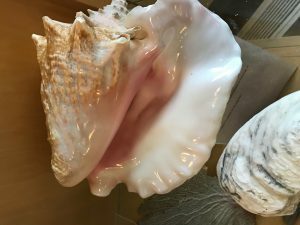 Conch, snails, clams, scallops and mussels make only one shell – they carry the same body armor they had as babies. 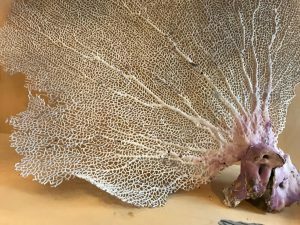 Sea shells can be plain and smooth or come adorned with spikes, ridges and protrusions. All shapes serve a purpose. 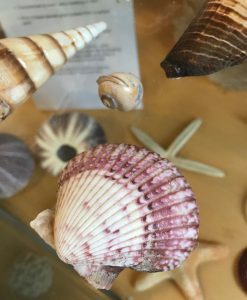 Smooth shells help mollusks avoid detection, get away quickly, prevent sinking into the sand or mud and keep them anchored to the surface. Adorned shells with spikes, ridges and protrusions help to ward off predators and are a cost effective way of creating strong body armor without too much weight. It also helps anchor them to the surface. 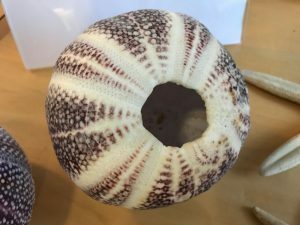 Species such as sea urchins, sea stars and sand dollars are characterized by hard, spiny covering or skin and grow outward from a central point. They have five part symmetry, an internal skeleton and their mouths are situated on the underside. They regenerate missing limbs, arms, spines – even intestines. Some can reproduce asexually by breaking off a ray or arm or by deliberately splitting the body in half. Each half then becomes a new animal. Coral are tiny soft-bodied animals within a stony skeleton (shell) or a soft skeleton. They are formed by free-swimming larvae (eggs) that attach themselves to rocks. The larvae then secrete a skeleton shell. Coral reefs are formed by the masses or colonies of sea shells. Most established coral reefs are between 5,000 and 10,000 years old. The ancestor of modern coral reefs were formed 240 million years ago. Abbott, R. T., & Dance, S. P. (1982). Compendium of seashells : a color guide to more than 4,200 of the world’s marine shells / by R. Tucker Abbott and S. Peter Dance. New York : E.P. Dutton, 1982. Harasewych, M. G., & Moretzsohn, F. (2010). 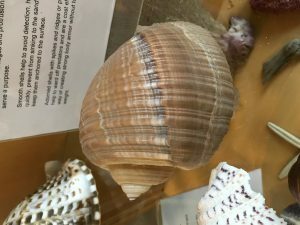 The book of shells : a life-size guide to identifying and classifying six hundred seashells / M. G. Harasewych & Fabio Moretzsohn. Chicago : University of Chicago Press, 2010. Hay, J., Norman, E., & Norman, M. G. (1968). The sandy shore / by John Hay ; illustrated by Edward and Marcia Norman. Chatham, Mass. : Chatham Press, 1968.